As a child, I spent summers visiting my grandmother in New Jersey. She had a life long companion named Tony, a short stocky man with a pronounced wattle to his walk and an underdeveloped arm that he kept tucked against his body like a broken wing. In my child’s mind, I likened him to a penguin. My grandmother would enlighten me – Tony had polio as a child. It would have been the early 1900s. 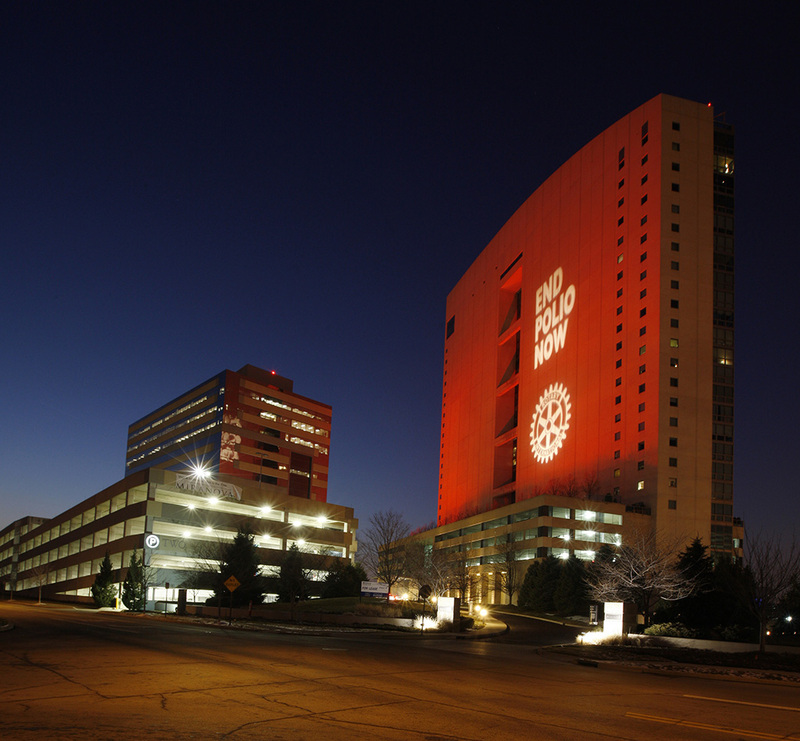 This past week Columbus – among other cities around the world – joined forces with Rotary International to broadcast their END POLIO NOW message by spotlighting the Miranova Building downtown. 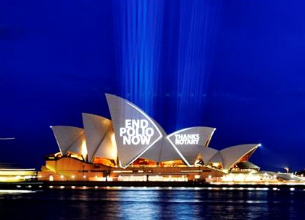 Over the past two years, as part of their fight to eradicate polio worldwide, Rotary has been illuminating landmarks including the Sydney Opera House and Chicago’s Wrigley Building. Polio, a disease that paralyzed many and killed others, was eliminated in the United States and most developed countries decades ago. Thanks to mass mobilizations to administer the polio vaccine, other countries followed suit. Yet in 2009, 10 of the 15 previously polio-free African countries were re-infected. In early 2010, a type-1 outbreak spread from India to Tajikistan, where it has paralyzed 239 children to date. The effort to raise awareness and money to end polio once and for all also involves those as diverse as Bill Gates and Jane Goodall, whose research with Gombe chimpanzees was once affected by a polio outbreak among the chimps. The Bill and Melinda Gates Foundation contributes upward of $200 million each year, yet Gates warned in his 2011 annual letter to the foundation that the campaign is still facing a $720 million funding gap for 2011-2012. We are so close, but we have to finish the last leg of the journey writes Gates. 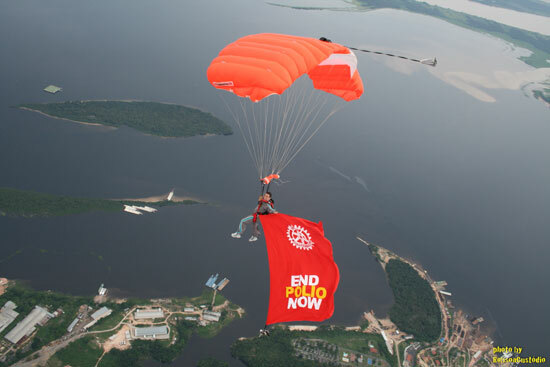 Rotary initially launched its efforts in 1985, a time when 1,000 children were paralyzed by polio every day across 125 countries. The organization has since contributed more than $900 million to the cause. Learn more about Rotary and volunteer opportunities by visiting www.rotary.org. To read more about the Gates Foundation visit www.gatesfoundation.org.